This project is an ongoing pursue around the question of how to overcome a creative block? Partnered with Lutfiadi Rahmanto, we started out scribbling, sketching and describing the problem to better understand what it meant for each of us and how do we scope this problem and usually respond to it. From the first session we were able to narrow the idea onto a determined goal: A tool to aid inspiration in the creative process. This led us to consider various things around the sought scenario and allowed us to start asking other creatives around this. We sought to better understand –qualitatively– how creatives describe a creative block and more importantly how is creative block overcome? 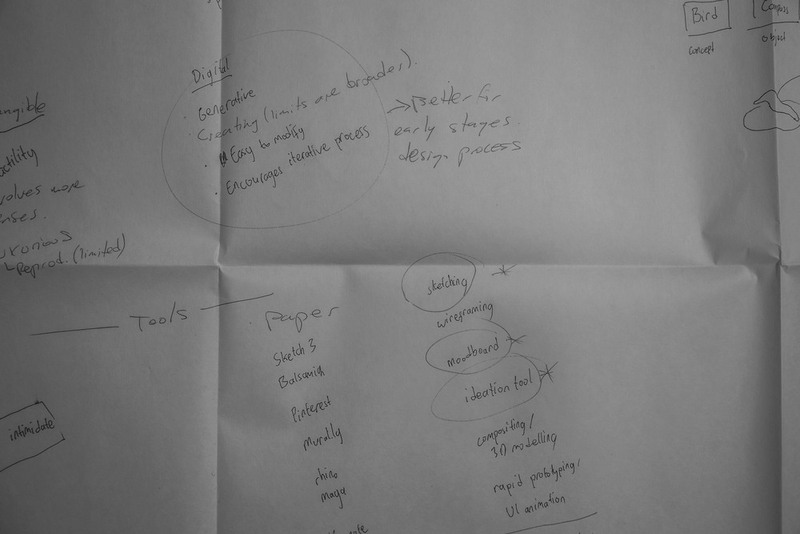 From this session we were also able to reflect on how to aid that starting point of ideating, often a hard endeavor. A resonating answer in the end, was through linking non-related words, concepts or ideas. We also researched two articles with subject matter experts about Creative Block and Overcoming It ("How to Break Through Your Creative Block: Strategies from 90 of Today's Most Exciting Creators" and "Advice from Artists on Hot to Overcome Creative Block, Handle Criticism, and Nurture Your Sense of Self-Worth"). Here we found a collage between our initial hypothesis with additional components such as remix, from Jessica Hagy's wonderful analogical method of overcoming her creative block by randomly grabbing a book and opening it a random page and linking "the seed of a thousand stories". Another valuable insight was creating space of diverted focus from the task at hand generating the block. We also found a clear experience-design directive for our app, to balance between constrain –structured scrambled data from the API– and freedom –imaginative play–. Encourage a diverted focus where people are able to create ideas by scrambling data from the Cooper Hewitt's database into random ideas (phrases). Through this research we created seven different behavior patterns and mapped them onto this two-axis map, that defines the extent to which personas would behave between casual/serious and unique/remix. This enabled us to create our guiding design path through what Lola Bates-Campbell describes as the MUSE. An outlier persona to direct and answer the usual nuances behind designing, in this case, our mobile application tool to aid Mae Cherson in her creative block. We determined her goals and thus her underlying motivations, what she usually does –activities– during her creative environment and how she goes around between small and greater creative blocks in her working space. We also describe her attitudes towards this blocking scenario and how her feelings entangle whenever seeking for inspiration. There were some other traits determined as well that can be reach in more detail through this link. Overall we crafted this Muse as a reference point for creating an inspirational experience for the selected archetypes –The Clumsy Reliever and The Medley Maker–. Parallel to the archetypes mapping, we began thinking how to engage our audience –Artists, Designers, Writers, Thinkers, Makers, Tinkerers, all poiesis casters–. Soon we realize the opportunity of captivating our audience through a game-like interaction. A gameplay that requires simple gestures and encourages discoverability. Some of the games we took as reference are Candy Crush and 2 Dots. Two simple games that have out-stand for their heavily and widespread engagement. By having research cues and possible game-like affordances in mind there's proliferous space to weave tentative design solutions. Hence we made a couple whiles to sketch layouts, concepts, poetic interactions and nonsense infractions. On the other side we created sense and sought a balance between amusement and feasibility. At the end of this session we came up with three Design Layout Concepts and general Affordances (call to interaction): Linking, Discovering and Dragging. From these concepts we started making interactive prototypes. 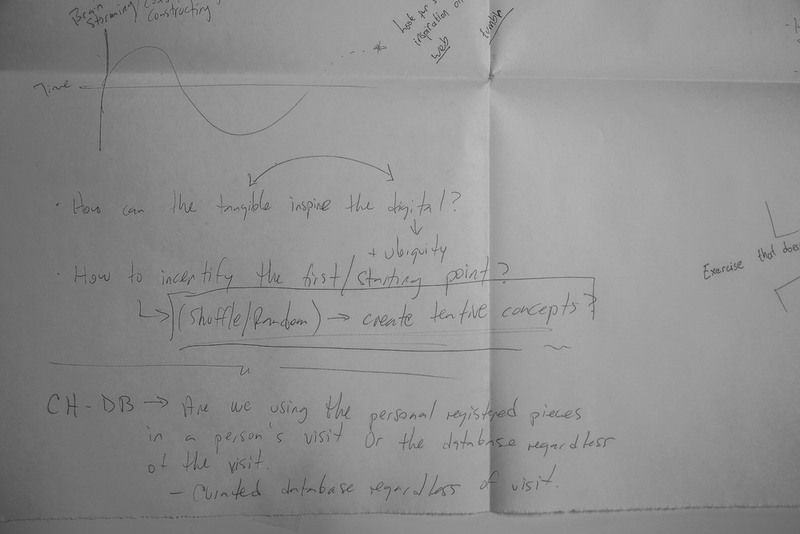 While creating the Discovering prototype, we realize people's intuitive mental model beneath a Candy Crush-like interaction did not match with our design intent, and trying to match it resulted overly complicated and forced. This is why we created prototypes for the Linking and Dragging concepts. 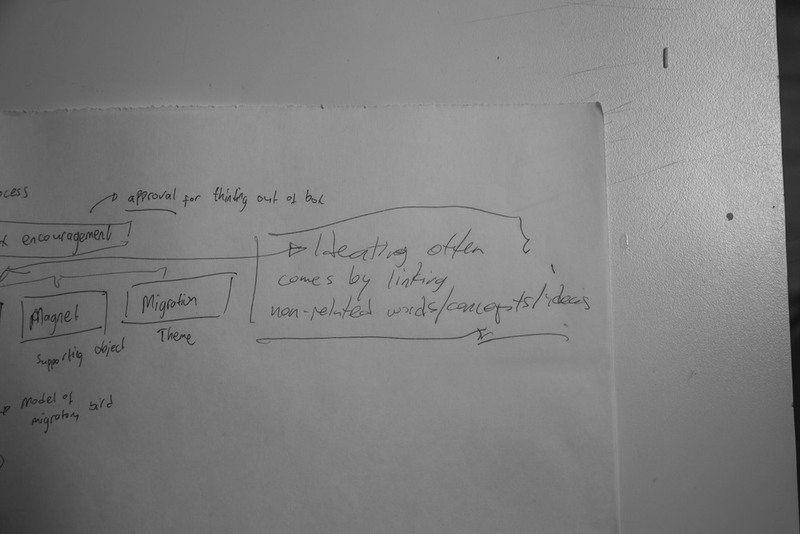 Another prototype explores the underlying preference between text-driven inspiration and visually-driven inspiration. While testing these prototypes we realize some people tent to feel more inspired by imaging the words from a text, and other people feel more inspired by visual queues. This prototype allows both explorations. The next step is to select one gameplay interaction from our user tests and sintactically address the text data from the API. This is another interaction mode –Remixing Mode–, thought after Katherine's valuable feedback on our final prototype that can be accessed in this link.